Emperor of Sand is Mastodon’s seventh studio album, inspired by the loss of family members of the band. The album is all about survival and death. The story of the album is about a desert wanderer who has been sentenced to death. 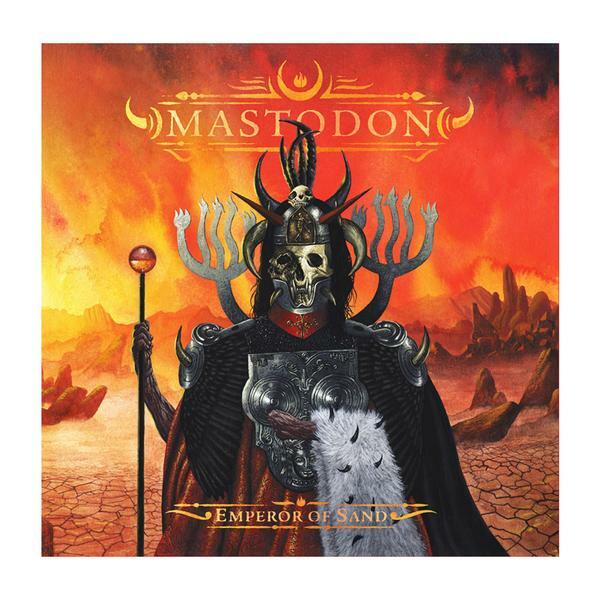 Emperor of Sand can be best described as a mix of the emotional aspects of Crack the Skye, with the hard hitting sounds that modern day Mastodon has worked on. As I’ve stated before in the announcement blog, the album cover depicts a royal figure that possibly resembles Death. The cover isn’t trying to out do the previous album’s cover. Nonetheless, Emperor of Sand has very nice artwork, reminiscent of Leviathan mixed with Blood Mountain. Mastodon’s modern sound is defiantly present in Emperor of Sand, and I can happily say that the album has met and surpassed my expectations. The songs have the heart, the sound, and the beat I’ve been expecting, and surpassed them with brutal riffs and beautifully inspired lyrics. My favorite songs off the album are Sultan’s Curse, Precious Stones, Steambreather, Roots Remain, and Word to the Wise. Mastodon has poured all their hearts into this album and it shows. Emperor of Sand is a fantastic album that I think fans old and new will enjoy. I give it 5 stars. Click here to get the album, available now.